Tasc Performance is a company that sells men's and women's workout clothing. I have seen reviews of their brightly colored workout tops and became interested. For my review, I was sent the green top, capris, and men's workout top seen in these pictures. They use Bamboo Performance Technology in their clothing to have a better workout material. They started up in 2009 to reinvent performance apparel. Their clothing is fairly affordable and comes in all different colors and styles. Something else that is very neat about these clothes is that they are UV protected! This is great for the summer where the sun is shining bright. I decided to wear my workout gear on Saturday morning to do an exercise video. The clothing fit perfectly which was great. It was very lightweight and comfortable. During the video, it seemed to wick away any sweat that I had and I felt cooler after the workout than normal. I really like the clothes! My husband was also sent this workout t-shirt which he is very happy with. When these Michigan temperatures get a little bit nicer, he will be able to go running and wear this shirt. The capris have some protective details in the back which is good for if you are outside in the dark. 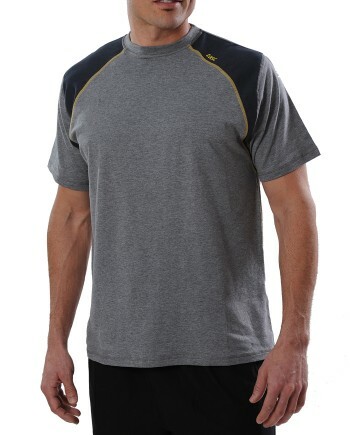 Tasc Performance clothing is comfortable and durable. I would definitely recommend it!